Karrar (Persian: کرار‎‎ karrār, "striker", is an unmanned combat air vehicle produced for the military of Iran. According to reports, the UCAV can bomb targets at high speed. It is the first long-range unmanned aerial drone manufactured in Iran. The long-range drone was unveiled on August 23, 2010, one day after the activation of the nuclear reactor in Bushehr. Television footage showed the president of Iran Mahmoud Ahmadinejad applauding as a blue cloth was pulled back to reveal a short aircraft, painted in military-green with the words Bomber jet on its side. The ceremony was held in a hall of Tehran's Malek Ashtar University. Later, the President Ahmadinejad stated, "This jet is a messenger of honour and human generosity and a saviour of mankind, before being a messenger of death for enemies of mankind." Iranian state TV said the Karrar has a range of 1,000 kilometres (620 mi) and could carry two 115 kilograms (254 lb) bombs, or a precision-guided munition of 227 kilograms (500 lb). The Karrar can also carry four Kowsar light anti-ship missiles or one Nasr-1 anti-ship missile. The Karrar unmanned combat air vehicle is 4 metres (13 ft) long, and is powered by a turbojet engine, giving a top speed of 900 kilometres per hour (560 mph). The Karrar uses a rocket assist system to assist in take off and is recovered by parachute. According to some western military analysis, the Karrar bears a striking resemblance to the MQM-107 target drone designed in the 1970s. According to a report from Denel Dynamics, however, the UCAV has significant design differences including the tailplane. ↑ "Iran Shows Off Unmanned, Long-Range Bomber". VOA News. 22 August 2010. Retrieved 22 August 2010. 1 2 Vogelaar, Rob (August 22, 2010). "Iran Unveils New Karar Bomber Drone". Aviation News. Retrieved August 23, 2010. ↑ Daragahi, Borzou (August 23, 2010). "Iran Reveals its Own Drone". Sydney Morning Herald. Retrieved August 23, 2010. 1 2 "Iran unveils first bomber drone". BBC News. 22 August 2010. Retrieved 22 August 2010. 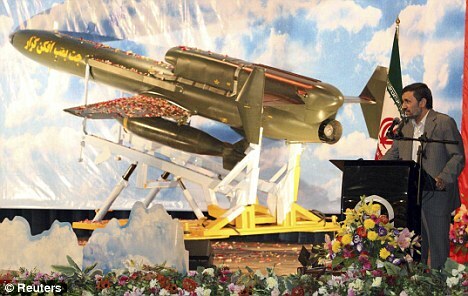 ↑ "Iran Unveils Domestically Produced Bomber Drone". Defense News. Retrieved 2010-08-23. ↑ "Iran unveils 'ambassador of death' bomber - World news - Mideast/N. Africa - Iran - msnbc.com". MSNBC. Retrieved 2010-08-23. ↑ The Associated Press (August 22, 2010). "CBC News - World - Iran unveils its own drone aircraft". Cbc.ca. Retrieved 2010-08-23. ↑ Keith Campbell. "New Iranian unmanned warplane not a SA copy, except, maybe, for the tailplane". Engineering News. Retrieved 2010-09-10. Submarine Simulator - Iran's "Tareq-class" submarine.